LibreOffice is a major free office suite that started as a fork of OpenOffice in 2010. While it is still fairly similar to OpenOffice, development has improved the suite in many different ways making it one of the better solutions when it comes to the creation of Office documents. 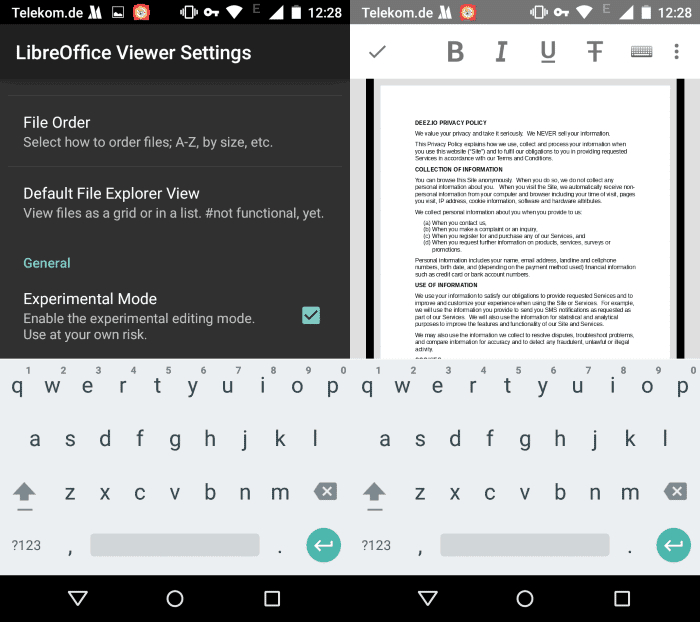 The Document Foundation released an Android app three days ago that complements the desktop office suite. LibreOffice Viewer is a reader application which means that it does not ship with document editing or creation capabilities. While that may be too limiting for some, it may be exactly what others are looking for. The installer requests one extra permission only, and that is to access files on the device. Since it needs to load documents before it can display them in its interface it is understandable that the permission is needed. The app itself opens as a file and folder browser that displays the full directory structure of the Android device starting in root. A filter is provided at the top to switch from displaying all files to specific types of files only supported by the application. You may select to display documents, spreadsheets, presentations or drawings only. The menu displays options to sort the file listing in different ways, for instance from z to a, by size or recency. Last but not least, you may switch to list view which displays file sizes and creation dates in the interface. A tap on a supported document type opens it in the reader. The only option apart from flipping pages is zoom which you can use to zoom in or out using touch. If you check the settings, you find an experimental editing mode listed there that you can enable. If you do, editing becomes available. The mode has its quirks; I ran into a display issue for instance as part of the document was entirely blacked out. Zooming helped resolve that issue on the other hand. Editing capabilities are rather basic, especially if you compare them to desktop office programs but also programs such as QuickOffice on Android. You get a couple of options apart from adding, removing or replacing text in documents which mostly come down to text formatting options. Still, the integration of the feature is a clear indicator that editing could become a full feature eventually in the future. on my S4, the program runs slow and fine for one minute… and only once! The 167KB ODT file couldn’t have been too big, could it? A knee way, it worked. I’ll reboot the phone to check again. Thanks, Martin, for the news. I’m on an SIIX and I read 1-15 Mb PDF files fine with Libre Office viewer all the time without it crashing. I’m still using the (well it isn’t free) Office Suite 8 Pro/Premium which is more or less an all-in-one solutions for PDF, Docs and such and it works quite well. 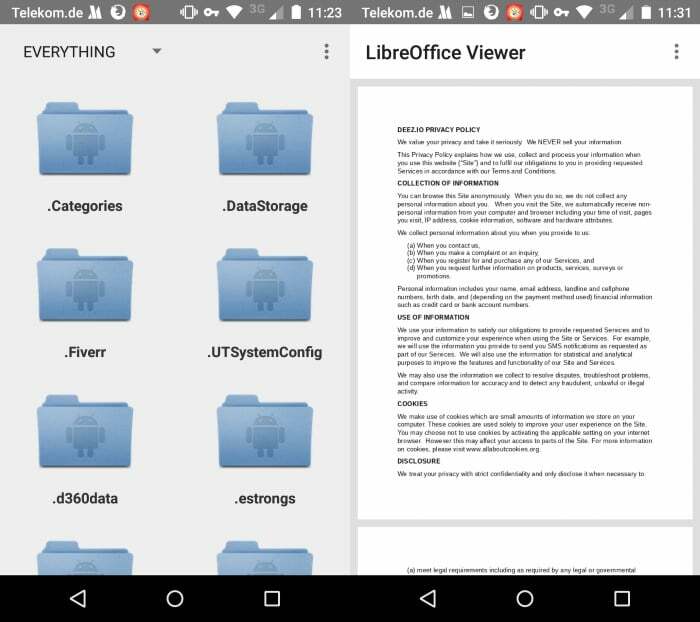 I tried the first preview from Libre as it was announced on F-Droid and I wasn’t impressed because it’s bigger in size, it’s still beta, it laggs compared to other solutions and other problems. On Ubuntu I’m quite happy with Libre. I am in dire need of the software and I have been struggling to write my documents .But now I hope my problem will be solved as I was only using Notes to write on my documents.